Last year I made the effort to go out and take photos each and every day. I figured that 1) I would find photography opportunities I would have otherwise missed and 2) that all the shooting would improve my photography. Well, I was absolutely right on both regards. Looking back at my favourite travel photos from 2012 makes me realize how many of those shots I wouldn’t have taken had I not pushed myself in that goal. Thus, it might seem a little bit strange that as a part of my 2013 New Year’s resolutions I made shooting less a priority. The truth is that I felt like I was really focusing far too much on life through the sights of my lens and not really taking it all in as a person. I have no regrets about last year, but this year I really want to slow things down and not feel the need to get everything on film. Yes, I know it sounds weird to hear of a travel photographer that wants to take less photos, but I feel this is really important. Not only do I feel like I need to do this for my personal fulfillment but as a way of improving my trade as well. I want to take photos with more thought put into them. I want to plan and compose more than I have before, I want to take my time waiting for the perfect shot more often rather than rushing to get as many images as possible. Anyways, this past week in Burkina Faso, I only took 100 photos, of which I’ve only kept 25. Now, I realize that still seems like a lot of photos to most people. However, last year I would have easily taken 500-1000 so it’s a massive improvement. The following are my favourite seven pictures of Burkina Faso from the past week. 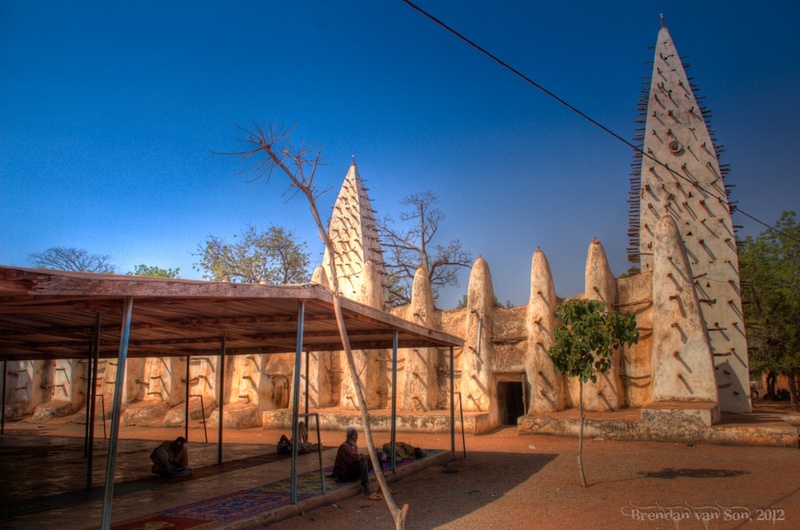 This is the grand mosque in Bobo-Dioulasso where I spent New Year’s. 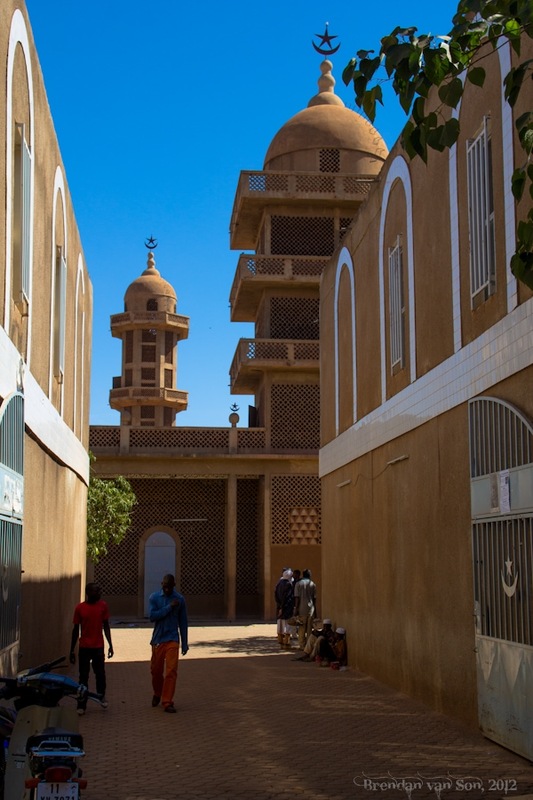 The mosque is built in a typical Sahel style. The protruding sticks are not just a matter of style. They also serve as clamps for the ladders for when the annual repairs are done after the rainy season. I can’t help but feel like this style of building is something right out of the Flintstones. Another shot of the mosque in Bobo. It was the time of Afternoon prayer and I used a 3-exposure HDR photo to capture both the light as well as the men who had just finished prayer. One of the skills that every photographer needs to work on regardless of their skills with the lens is that of building relationships with your subjects. 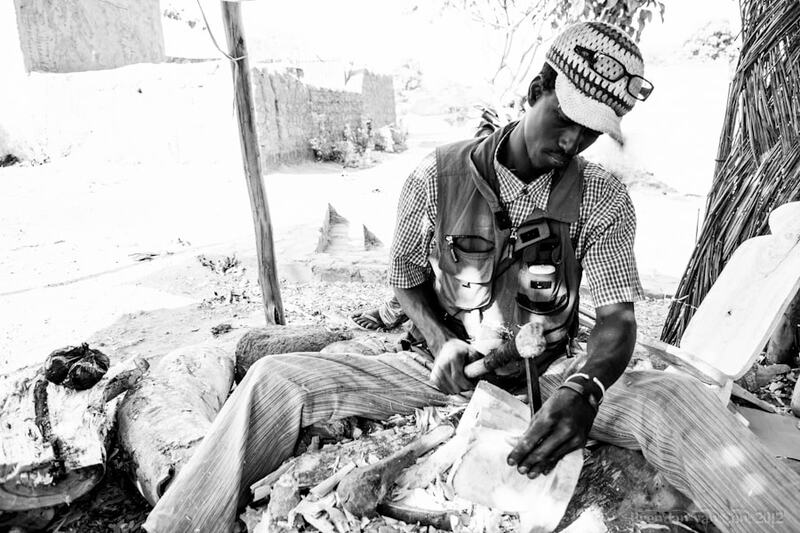 I sat down with this wood carver in the old town of Bobo-Dioulasso and chatted with him about everything from girls to his trade. Eventually, he became so comfortable around me that as he worked on his trade he looked as comfortable as he would have had there not been a camera around. 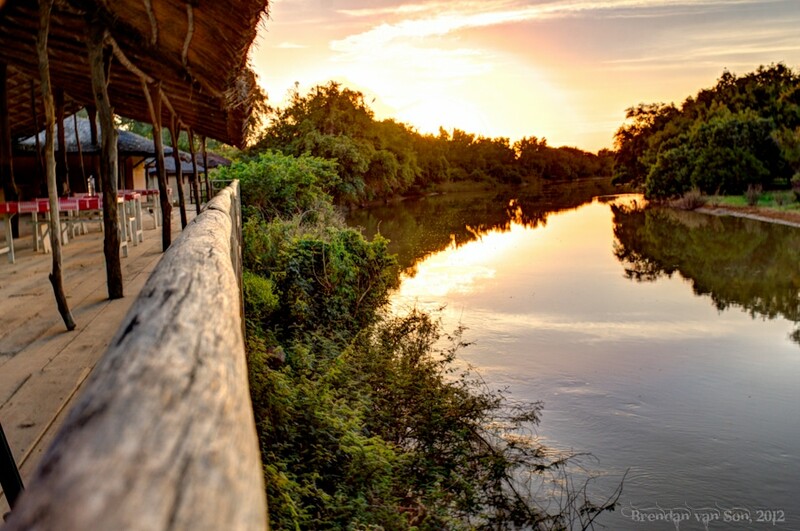 Half-way between Bobo-Dioulasso and Ouagadougou is the town of Boromo and Deux Bales National Park. In the dry season elephants can be seen right around the camp here where this photo was taken. Unfortunately, there is still too much water for elephant viewing still. However, having this perch all to myself was certainly worth the trip. The beauty of the desert is quite often the night. An evening in the desert is rarely pitch-black as stars always light up the sky with a certain force. On this night in Deux Bales National Park I used Anne Murray as a subject of my star photography. I lit Anne Murray from the side with the video flashlght from my iPhone 4. 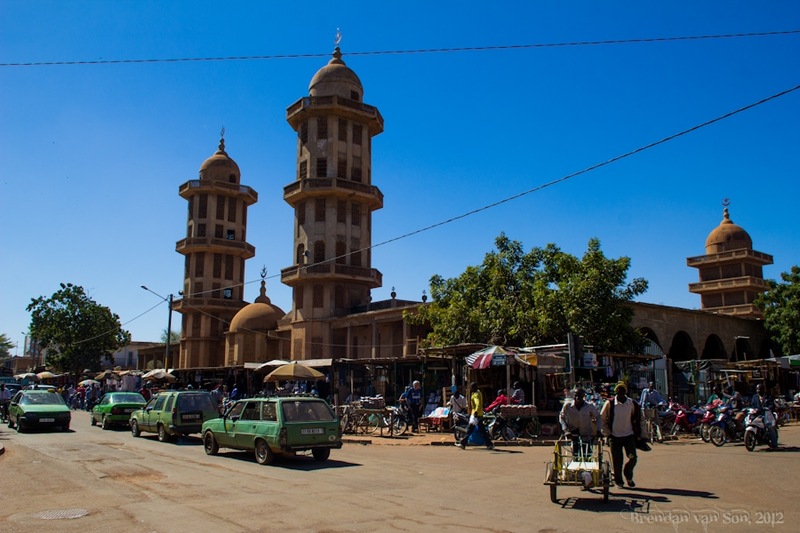 The Grand Mosque in Ouagadougou might not be as interesting as the one in Bobo but the bustling market around it make it a great experience. You can buy pretty much anything you’d like from the streets around the mosque, and with all that activity, and the brilliant contrasts in colours, it makes for an interesting photo subject. Compared to the streets outside, the entrance to the mosque s peaceful and quiet. It seems world’s away from the activity just outside. Next ArticleThe Winning Photo from National Geographic’s Annual Contest is From a Zoo? 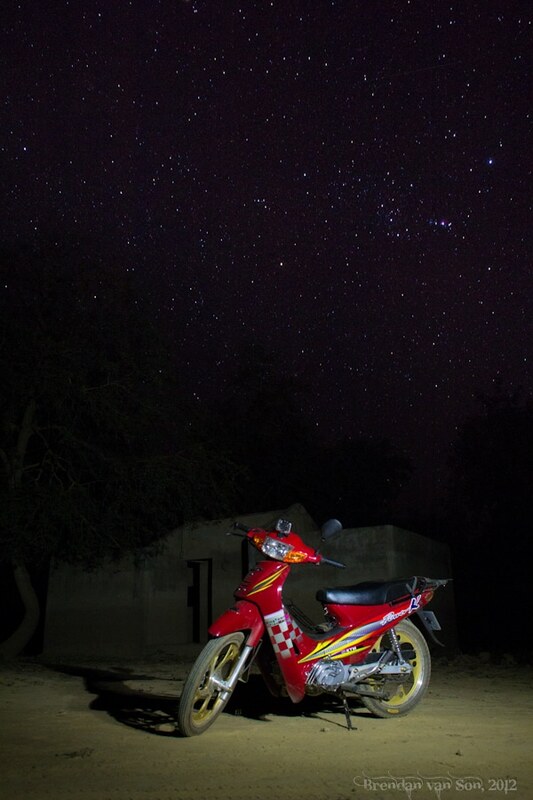 Love the photo of the moto and the stars! Looks like an amazing place to travel to. Love the 1st photo of the mosque. There’s a lovely sense of mystery, dreaminess but with those spikes, a bit of danger. Why the spikes? Thanks! The spikes are to hold the ladders, or feet, of people re-plastering the mud each year! Great set of captures. 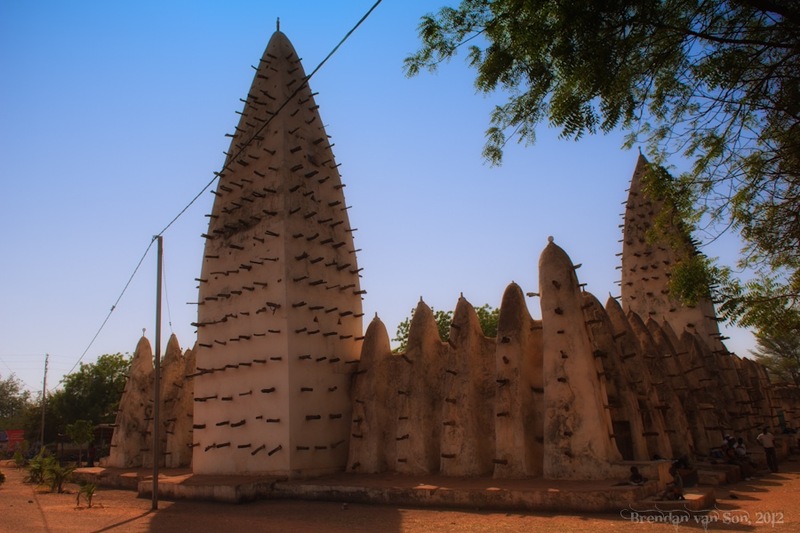 Burkina Faso looks like an amazing place. What a wonderful set of images.Your wood carver doesn’t look like he’s missed a beat with you taking his photo. Thanks Leigh – It’s the magic of making friends THEN making photos… people are much more at ease. Great photos Brendan. I especially like the one of the wood carver. It’s very true what you say about pushing yourself. Sometimes it’s just easy to leave the camera at home, but then you miss the most amazing of shots.